We were at the end of a very long and busy weekend, and we were exhausted. 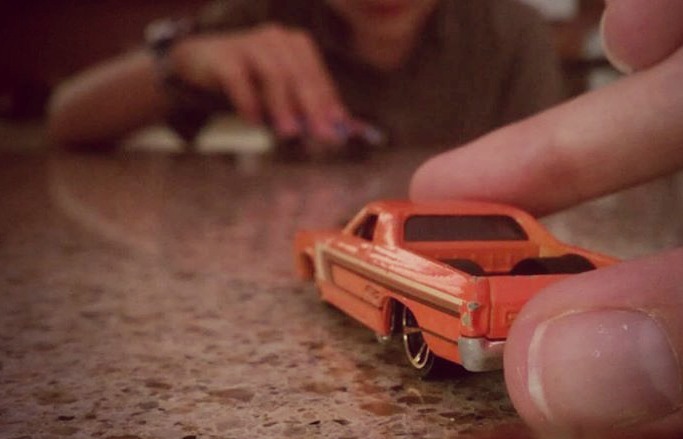 Across from me, my son and daughter were playing with their tiny metal cars. I kept foreseeing a cup knocked over from a racing toy or a scratched counter. At that point, it didn't matter. A mom knows when to pick her battles. Suddenly, a car came speeding in my direction. I gently knocked it back over to my son so he could keep playing. A few seconds later, the same car bumps back into my arm. I looked up at my son, who had an inviting grin on his face. I'll admit - the first thought that came to mind wasn't, "Cool, let's play!". It was more along the lines of, "How can I get him playing with his sister so I can keep working? ", or "Oh little man, not now...."
But those thoughts were tiny, as if whimpered from some part of me that knew what should be done but simply didn't have the energy to do it. So I spun the car back to him. And so began the epic game of Car Hockey. For the next 20 minutes, cars were flying everywhere. Bump here, bump there. My daughter delighted in picking up every single one that flew off of the counter, which kept her quite busy. We'd pause each time someone ran out of cars, or got hit in the finger, or simply needed a break. There were no winners or losers in this game - just speeding cars and smiles. I haven't spontaneously laughed so hard in quite some time. Eventually, the volume turned back up on the voices reminding me of what else was waiting to be done. By that time, we'd had our giggles and my son and daughter were ready to move on to another game. The evening continued. Laundry was started, a few things cleaned up, dinner eaten, and the kids snuggled into bed. The hours passed pretty much as they would have otherwise. But now, we have a new game. We have a new memory. And perhaps best of all, for a few unexpected moments in the middle of the afternoon, we were playing and laughing. I wasn't worried about what was waiting for me - I was playing with what was right in front of me. As a reminder for myself, I've left those cars on the counter. One never knows when it might be time for Car Hockey.